Because you wear a medical bracelet literally 24/7, it has got to be right. That's why every bracelet is made in the USA so they'll always be accurately custom fitted to your wrist…with just the perfect amount of room for comfort. How to size. At Medical ID Fashions, all medical bracelets are custom sized and handcrafted in the good old USA where quality still stands for something! To make sure all bracelets fit correctly, skilled artists work day and night using our scientifically accurate sizing method. This exclusive scientific sizing is always correct with an accurate skintight measurement of your wrist using a soft tape measure. 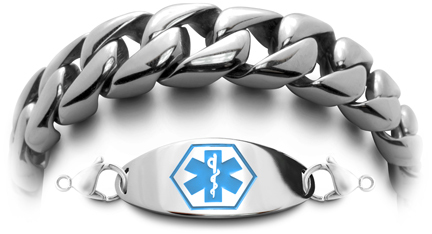 All medical bracelets are "overbuilt" for a longer lifetime and to keep you safe. We use proprietary methods and materials designed to give you a superior bracelet. Just read the comments by some of the many thousands of happy customers that have already discovered the virtues of a beautifully handmade medical bracelet. Our founder, Abbe Sennett is a 16 year cancer survivor, artist, jeweler and inventor that finally makes wearing a medical bracelet a pleasure instead of an embarrassment. It all came out of a "necessity" because the choices out there were from "slim to none". From the first day that Abbe started making these designer bracelets, the choices have grown to over 600 styles. This gives America the world's largest selection of custom sized medical ID bracelets all handmade to be stylish and to fit comfortably the way it should be. It’s a good thing Abbe started making these stylish medical bracelets because today there are over 150 million Americans that must wear a medical bracelet to stay safe—and they no longer want to wear those ugly, stamped-out factory ID's from drugstores. 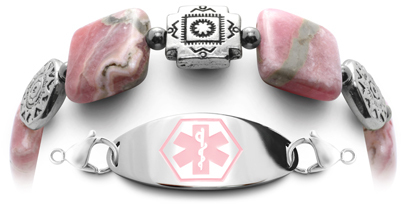 Most customers are new to medical bracelets, so we always call to confirm that every order is correctly sized and every ID tag has all of your medical information presented in an effective format. See Beginners Guide. Unremovable medical bracelets for people with Alzheimer's/Dementia and Autism because too often they remove their bracelets leaving themselves unprotected. To help prevent easy removal, we use our exclusive “ALZ and AUT Design”—making these bracelets virtually unremovable. See Alzheimer's Sets and Autism Sets.